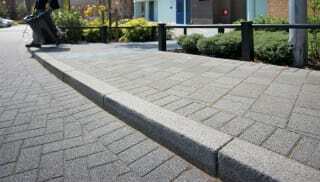 The textured kerb range from Marshalls offers a durable and complementary solution for any urban landscaping project. Available in a range of materials, styles and colour options, there’s a product available for every environment. Saxon textured kerb stones utilise a wider and squarer profile than standard kerbs, making them perfect for modern projects. Available in 2 natural colours, Saxon concrete kerbs incorporate Yorkstone aggregates to achieve a natural looking appearance, further enhanced by a secondary shot of sandblasting. Conservation textured kerb products combine the appearance of granite aggregates with precision manufacturing to aid durability and style. Their textured natural appearance, perfect for areas where aesthetics are key, is further enhanced by a secondary shot texturing process. The Charnwood range offers a cost-effective alternative to Conservation kerbs, with warm, understated, rustic aesthetics achieved without the need for a secondary process, which makes it perfect for unique designs. 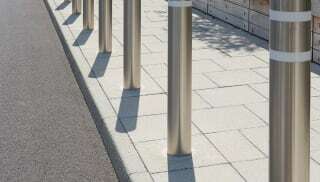 Browse the full textured kerbs range now.